Azospirillum is an associative symbiotic nitrogen fixing bacteria. It is considered to be more efficient with nitrogenase properties. Almost all crop plants harbour this bacterium in the roots. It penetrates into the roots of the plants, colonizing there and fixes substantial amounts of nitrogen there by saving costly nitrogen chemical fertilizers. It also produces some Phytoharmones like IAA & GA and these helps in enhancing plant growth. Due to Azospirillum the crop was benefitted to the extent of about 40kg N/ha. Along with nitrogen it also increases the absorption of other minerals and water. Recommended crops: This is recommended for all types of crops like Paddy, Sugarcane, Banana, Oil palm, Mango, Grapes, Cashew, Cotton, Chilli, Sunflower, Mustard various oil seeds Maize, Wheat, Jowar, Oat, Barley, Bajra, Ragi, Sorgum, Turmeric, Tea, Coffee, Tobacco all types of fruits, vegetables, Horticulture crops etc. Seed treatment: Prepare the slurry of lOOg of Phosphobacter and lOOg of Nitrogen fixer with 5 lit water, mix the seeds evenly in the slurry to get uniform coating on all seeds. Sow immediately after drying the treated seeds. Seedling treatment: Prepare the suspension of 1 kg Phosphobacter and 1kg of Nitrogenfix in 10 lit of water. Dip the seedlings in the suspension for 30 min and transplant the treated seedlings immediately. Soil Application : 15kg Phosphobacter and 15kg Nitrogen fixer mixed along with Compost or Vermicompost in 1:10 ratio to apply the material equally in an Hector. Packing: Krishna Azospirillum is available in 1kg, 2kg and 6kg packing and the normal dosage of Krishna phospho, Azo is 15-20 kg per Hector. Dosage will vary based on various Geo & Climatic conditions, crop and soil requirements. 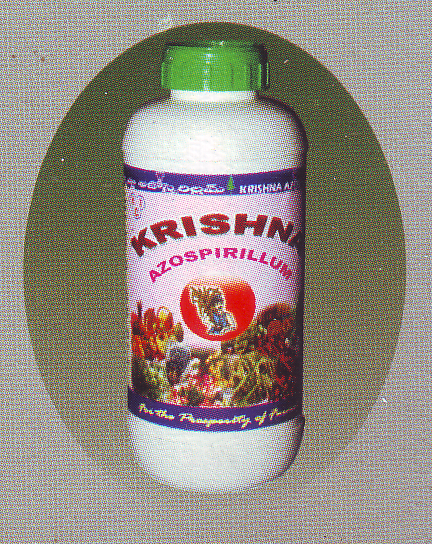 Krishna Azospirillum is available in liquid form also and should be applied by drip irrigation or spray per Hector on 2 liters basis. Liquid Azospirillum is available in 250ml, 500ml & 1000ml basis.